– Rather then selecting the scenes and characters at the beginning, Toontastic Jr simply requires students to select a beginning, middle and ending. The characters are matched to the different scenes. 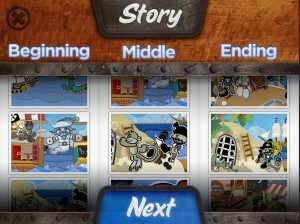 – Toontastic Jr will then begin the scene for students and then students are asked to continue the scene. – As with the original Toontastic, Toontastic Jr still allows students to record movement, voices and select music to enhance the mood. Download this app soon, otherwise it will cost $1.99 to download.